Background Th17 cells are central pathogenic mediators of autoimmune disease, including many forms of GN. IL-10 receptor signaling (IL-10R) in regulatory T cells (Tregs) has been implicated in the downregulation of Th17 cells, but the underlying molecular mechanisms and functional relevance of this process remain unclear. Methods We generated mice with Treg-specific IL-10Ra deficiency and subjected these mice to nephrotoxic serum–induced nephritis as a model of crescentic GN. Immune responses and Treg phenotypes were extensively analyzed. Results Compared with controls, mice with IL-10Ra−/− Tregs showed a spontaneously overshooting Th17 immune response. This hyper-Th17 phenotype was further boosted during GN and associated with aggravated renal injury. Notably, abrogation of IL-10Ra signaling in Tregs increased dendritic cell activation and production of Th17-inducing cytokines. 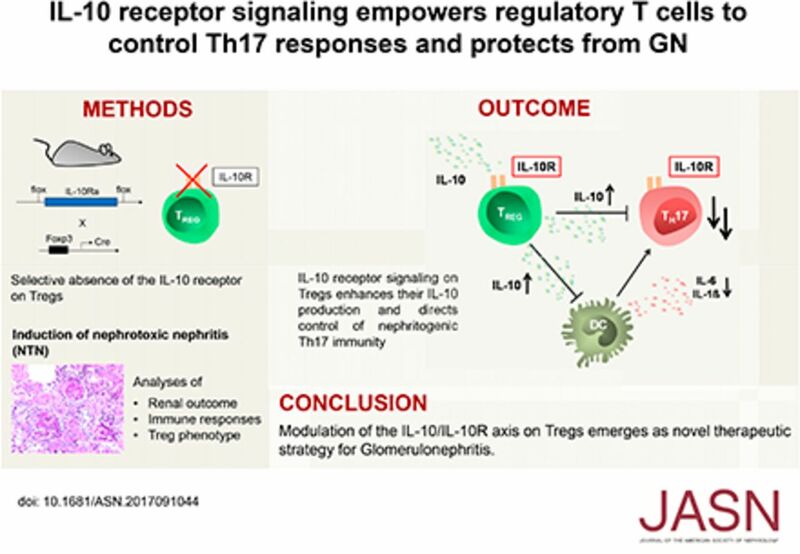 In contrast, Treg trafficking and expression of chemokine receptor CCR6 remained unaffected, indicating mechanisms of Th17 control, differing from those of previously identified CCR6+ Treg17 cells. Indeed, the capacity for direct in vitro suppression of Th17 responses by IL-10Ra−/− Tregs was significantly impaired. As underlying pathology, analyses conducted in vitro and in vivo using double-fluorescent reporter mice revealed strikingly decreased IL-10 production by IL-10Ra−/− Tregs. To assess, whether reduced IL-10 could explain the hyper Th17 phenotype, competitive cotransfer experiments were performed. Supporting our concept, IL-10Ra−/− T cells differentiated into Th17 cells at much higher frequencies than wild type T cells did during GN. Conclusions IL-10R engagement optimizes Treg-mediated suppression of Th17 immunity. We hypothesize a feed-forward loop, in which IL-10Ra signaling reinforces IL-10 secretion by Tregs which potently controls Th17 development via direct and indirect mechanisms. IL-10R thus may be a promising therapeutic target for the treatment of GN.